A pair of teenage entrepreneurs from Shawinigan Lake are donating proceeds from their new line of clothing and merchandise to Wounded Warriors Canada. The two siblings, Mckenna Haz, 19, and her younger brother Cooper Haz, 16, used the annual Wounded Warrior Run B.C. charitable event to launch their new business KidLED and its first line of clothing ‘WW1 Centennial Collection’, which commemorates the 100th anniversary of the end of the First World War. 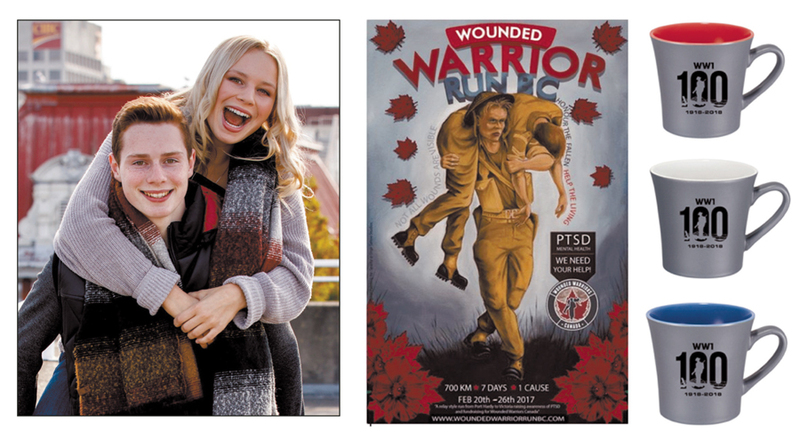 They will donate 10 percent of profits generated from product sales to Wounded Warriors Canada, which has been raising the bar on public awareness surrounding Post-Traumatic Stress Disorder (PTSD) and mental illness for military and first responders. Co-founder Mckenna says aligning KidLED with Wounded Warriors Canada, seemed a natural first step for the business because of the cause, and her family’s personal connection to the cause. Wounded Warrior Run B.C. runners set off from Port Hardy Feb. 19 for the six-day, 600-kilometre relay style run that ended in Victoria on Feb. 25. Captain Jacqueline Zweng, Regional Cadet Support Unit (Pacific), is this year’s Wounded Warrior Run B.C. Director, and says the runners are glad to see this kind of support from KidLED. The last three letters in their business name LED stands for Leadership, Education and Development. Mckenna says, while their overall goal is to build a successful small business through the sales of clothing and merchandise, KidLED is defined by its mandate to help fund non-profits such as Wounded Warriors Canada and other community organizations. The matriarch of the Haz family, Kristie Haz is also a co-founder of KidLED, and says she and her two children came up with the idea two years ago and they have been working hard to put their plan in to action. Kristie is extremely proud of her two kids. Her daughter is an accomplished rugby player who recently accepted a scholarship at Quinnipiac University in Hamden, Connecticut, and will get to work on a degree in Communications next fall. She was also crowned Miss Teenage Vancouver Island in 2015, and with this platform she was involved in successful fundraising campaigns for Free the Children, KidSport and Cardiac Kids. Kristie says her son Cooper is an avid rower and hockey player, but also has academic strengths in information technology and science. Cooper attends Brentwood College in Mill Bay and will play a vital role in marketing and fundraising initiatives in his free time.